References to the internet of things (IoT) are everywhere. In fact, it’s difficult to find anything written in the last few years related to smart manufacturing, supply-chain transformation, logistics, factory automation or data collection that doesn’t reference the IoT or the industrial internet of things (IIoT). For those who may be unfamiliar with the terms, the IoT can be defined as the interconnection via the internet of computing devices embedded in everyday objects, enabling them to send and receive data. The IIoT is a network of intelligent computers, devices and objects that collect and share data on the factory floor. Various types of sensors are at the heart of most IoT-related solutions. Installing sensors on the shop floor can provide plant leadership with valuable data in real time. Alerts can be generated based on predefined parameters and sent to anyone who needs access to the information. Predictive analysis, real-time monitoring, mobile alerts and notifications are just some of the ways the IIoT can make your plant more efficient. While there are many reasons, the following five factors are driving more companies to implement IIoT-enabled solutions in their plant. Primarily because of mass production, lower hardware costs have had a significant impact on the IIoT. In the past, the need for multiple sensors and various hardware devices made a meaningful installation on a larger scale cost-prohibitive. Today, that’s simply not the case. The difficult part is determining which types of sensors you need, where to apply them, what limits you want them to react upon and how you will utilize the information. Universal internet connectivity has made access to information easy, fast and relatively inexpensive. From anywhere in the world, I can log onto my corporate network and see whatever I want. The value this access and flexibility to view information brings to the factory floor is incredible. Some of the questions then become: What information do I want? How do I want it displayed? Whom do I allow to have access to the data? Where do I store the information? What’s the role of information technology (IT) in manufacturing data and support? Is security an issue with these types of devices? More IoT-ready devices and sensors are coming to the market on a nearly everyday basis. These include sensors to measure pressure, proximity, contact, vibration, displacement, location, velocity, temperature, current, etc. These sensors use a variety of inputs, such as electromagnetic, photoelectric, optical, radio and other signals. In addition, they communicate with various types of ethernet, wireless and Bluetooth protocols. There are also hundreds of brands or variations of each, and your employees will expect these devices/interfaces to provide the same functionality as their personally owned smartphones and tablets. While it’s not rocket science, hardware standards, data-reporting methodologies, communication protocols and general questions will be abundant. Software analytic tools are now available at little or no cost from many sensor manufacturers. They vary greatly in overall capabilities, but for the most part provide plenty of potential value. By utilizing these tools where data is available from numerous sensors working together, it is possible to construct algorithms to predict and monitor real-time scenarios and take corrective actions almost instantaneously. This is one of the biggest value propositions to using this technology. The image below shows vibration data from a sensor on a critical motor. Which team of engineers in your organization would be dedicated to monitor this information 24 hours a day/seven days a week? What corrective actions can be identified from the data below? Do you employ anyone who can read the data? 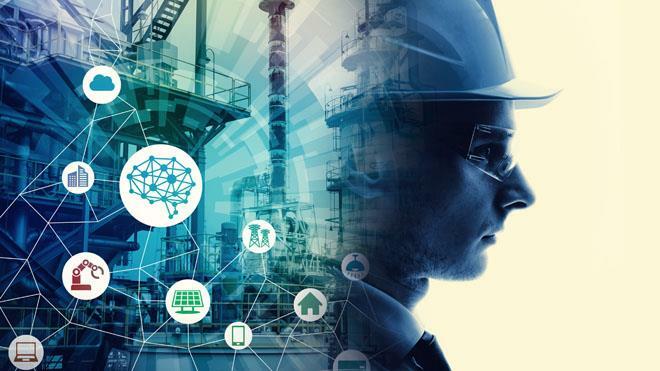 Interconnected hardware, handheld mobile devices and access to information via cloud-based services have significantly changed manufacturing’s utilization and justification of IIoT technology. Cheaper cloud-based services combined with real-time information open up all kinds of possibilities. Rather than taking on these challenges along with your day-to-day activities, it may be more cost-effective to work with a third-party organization that specializes in data collection, sensors and remote monitoring. Careful consideration will be key. Companies considering this technology should carefully weigh the value of the information collected to their plant and have a detailed answer to the question of “What do we intend to do with the information collected to improve the productivity of our factory?” Don’t do technology for technology’s sake. If you don’t have a clear answer to the question above or are not aware of what can be done, consult an expert to help make sense of the data’s value to your plant. My first endeavor into sensors was back in the early 1980s. In those days, many of us struggled to see the value in utilizing an incredibly expensive device to provide very little information that nobody ever used. The change in cost and capabilities has surpassed anything I could have imagined in those days. Low-cost wireless sensors combined with the analytics and communication media available on the factory floor today make this technology a viable, cost-effective tool that can drive down production costs and improve overall profitability. Of course, you have to be smart about it and willing to be painfully honest about your company’s strengths and weaknesses. Based on my years of manufacturing experience, my recommendation would be take advantage of your company’s identified strengths and rely on others to help in the areas of weakness. But there’s really no question when it comes to "sense or not to sense."